Photo: Zsolt Szigetvári. “Political trials = shaken order” reads the white banner. 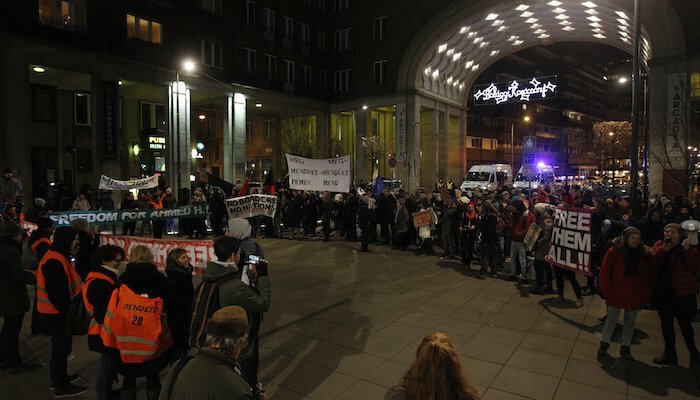 Hundreds demonstrated for the release of Ahmed H., the Syrian man sentenced to ten years in prison for allegedly inciting migrants and threatening Hungarian officials at the Hungarian-Serbian border in Röszke on September 16 last year. Migszol (Migrants Solidarity Group) activists pointed out that he was fleeing terrorism with his family. Of the ten migrants sentenced to date, Ahmed H. was the only one accused of committing an act of terrorism in the Battle of Röszke, which pitted unarmed refugees and asylum seekers against Hungarian riot police and counter-terrorism forces. A number of people, including western journalists, were hurt in the clash. 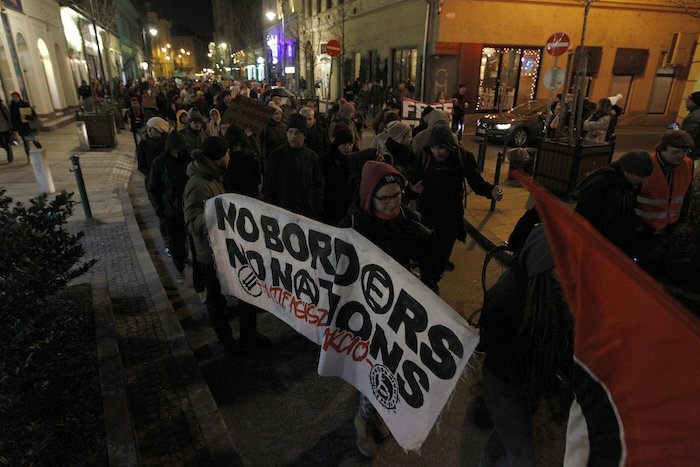 The first-level court convicted Ahmed H. of committing a terrorist act with the “violent crime” of inciting a crowd to Hungary illegally and threatening Hungarian officials tasked with defending the border. The court also permanently banned Ahmed H. from Hungary. Should the accused decide not to appeal the verdict, he will be eligible for parole after serving two-thirds of his sentence. Hungary’s ruling Fidesz party and its chairman, Prime Minister Viktor Orbán, greeted the decision as a kind of milestone in the fight against terror. Addressing the crowd, a Migszol activist from Syria called attention to the fact that it was terrorism from which Ahmed H. and his family were fleeing. A message was read out from Amnesty employee Áron Demeter promising that his organization would do everything it could to support Ahmed’s cause and calling for the sentence to be struck down on appeal. 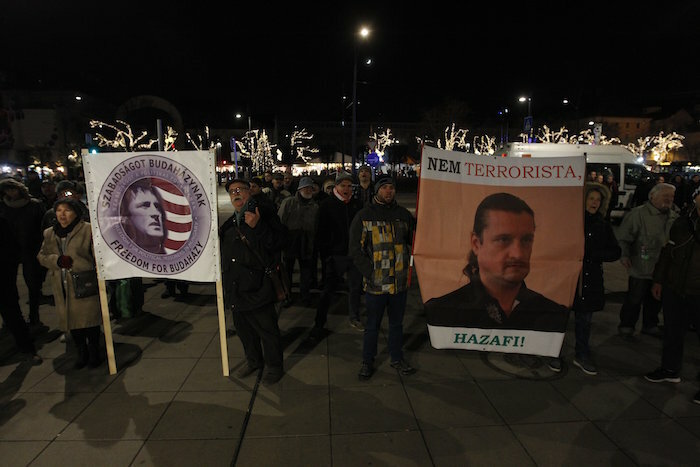 Krétakör founder Árpád Schilling told the crowd: “If Ahmed is a terrorist, then I am also a terrorist.” Placing responsibility on those working in the criminal justice system, he called on the country’s judges and prosecutors not to assist in this. 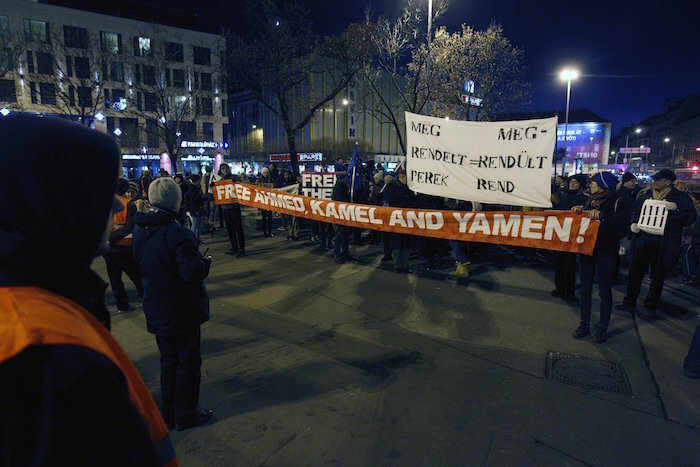 After the speeches, several hundred protestors, including a number of foreign activists, moved to the Madách square, chanting “Freedom for Ahmed” and “Today Ahmed, tomorrow you,” and blowing whistles, shaking rattles, and beating drums, reports index. The two groups were kept separate from one another by a police cordon and no incidents were reported. Ahmed H. was the tenth migrant to be sentenced over Röszke and the only one charged with terrorism. Consequently, he was the only one to receive so severe a sentence.